Solar heat absorbed through windows and roofs can increase your air conditioning use. Incorporating shading concepts into your landscape design can help reduce this solar heat gain, by reducing surrounding air temperatures as much as 9° F (5°C). Because cool air settles near the ground, air temperatures directly under trees can be as much as 25°F (14°C) cooler than air temperatures above nearby blacktop. 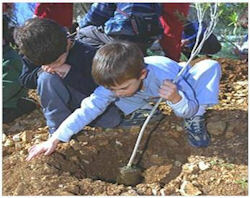 Planting trees on the South and West sides of your home will produce the greatest energy efficiency benefits. 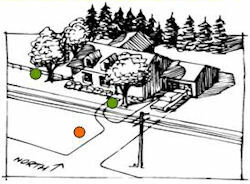 Trees on the north end of your property can help reduce heating costs by reducing winter winds. Also, consider shading you air condoning unit, making it run more efficient. Do not plant trees near power lines or any other overhead obstacle. Be sure your plants and trees have sufficient room to grow properly; do your research! Native plants (also called indigenous plants) are plants that have evolved over thousands of years in a particular region. They have adapted to the geography, hydrology, and climate of that region. As a result, a community of native plants provides habitat for a variety of native wildlife species such as songbirds and butterflies. Native plants provide a beautiful, hardy, drought resistant, low maintenance landscape while benefiting the environment. Native plants, once established, save time and money by eliminating or significantly reducing the need for fertilizers, pesticides, and water and lawn maintenance equipment. For more information on native species please visit the Houston Chapter of The Native Plant Society of Texas, or the Texas Master Naturalist Web sites and start planting native! Million Trees + Houston is an exciting public / private initiative designed to vastly increase one of the Houston area’s greatest natural resources, its trees. Houston, the nation’s fourth largest city, is kicking off its ambitious plan after studying the Million Trees efforts of our country’s three larger cities, New York City, Los Angeles, and Chicago. Unlike the others’ 10 year goals, Houston and its collaborators have set a three-to-five year goal. Key partners in this effort are the City of Houston, TxDOT and Harris County for the public sector, and Trees for Houston and the Quality of Life Coalition for the private sector. Also, many corporations will be asked to participate this year and next in a special “Gift of Trees” program, as part of the Million Trees + Houston initiative. An interactive, bilingual Million Trees + Houston Web site invites non-profits, management districts, civic and neighborhood associations, schools and individuals to plant and maintain trees and to list them on the Web site. Houstonians are well-known for our love of trees. Our neighborhoods are green and comfortable places to live and work. Decades of planting pines and oaks and flowering trees around homes and businesses have resulted in the presence all around us of a mature urban forest. Our trees are a source of pride for us all. But planting this urban forest is an ongoing enterprise. The Houston Parks and Recreation Department, in conjunction with Trees for Houston, encourages you to improve the quality of life in your neighborhood by taking advantage of the NeighborWoods Program, a private/public volunteer initiative aimed at providing Houston neighborhoods with beautiful trees free of charge. NeighborWoods enhances and enriches area landscapes by working with neighborhood and community organizations to plant and help maintain trees in residential rights of way. 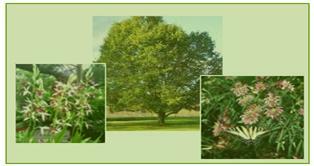 Citizens wishing to participate in the program and obtain a brand-new 5-gallon tree, can contact NeighborWoods by filling out the appropriate request form (.pdf) and sending it to the Houston Parks and Recreation Department's Urban Forestry Division. In exchange, you must agree to pick up your tree and plant it properly on the right of way adjacent to your property and maintain its growth and development for two years.